This beautiful holiday villa lies on the best part of Savinska Dubrava heights, not far away from Herceg Novi centre. A children room with TV and sofa, a spacious living room. This beautiful holiday villa lies on the best part of Savinska Dubrava heights, not far away from Herceg Novi centre. A children room with TV and sofa, a spacious living room, high quality kitchen all with exit to pool area lie in the ground floor. 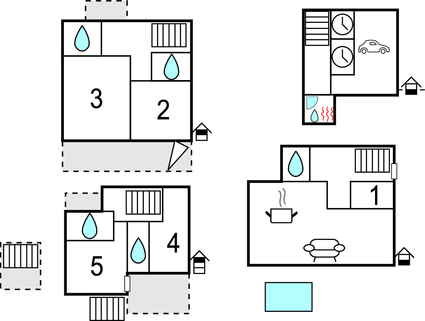 Bedrooms with bathrooms lie on upper floors. All terraces provide amazing panoramic views. Spacious interior offers a peace of privacy for each family member and luxury ambience. Spiral staircase on second floor leads to the viewpoint on the very top of the villa where you can enjoy stunning views over the entrance to Boka Kotor bay, known as one of the most beautiful bays in the world. A sauna and a whirlpool that lie in the souterrain are perfect relaxation spot. Smaller children can enjoy children amenities on the lawn next to the pool. Nearest swimming points are concrete piers and pebbly beaches only 500m far. With additional payment you can enjoy extra offer by the owner like his restaurant, a private beach and a yacht all less then kilometre away. Neighbour accommodation is villa MNH202 ideal to rent simultaneously if your are a large family or group of friends. Out of this lovely property you can enjoy various coastal offer. Visit old town of Herceg Novi adorned by lot of flowers and stairs, enjoy walks through charming town of Perast, visit Igalo health centre or famous Kotor with beautiful old town and it’s medieval walls. Simply provide your family a holiday to remember with stay in this comfortable holiday villa. Many coastal towns offer unique sunset views within scenery of mountains and the sea. Hope you will use the chance to have a unique experience and spend an unforgettable vacation in this place. This beautiful modern villa is made from brick or stone and was recently built in 2010. The agent has rated it as a five star property so it is one of their best villas - tastefully furnished and fully equipped. It is also great value for money. 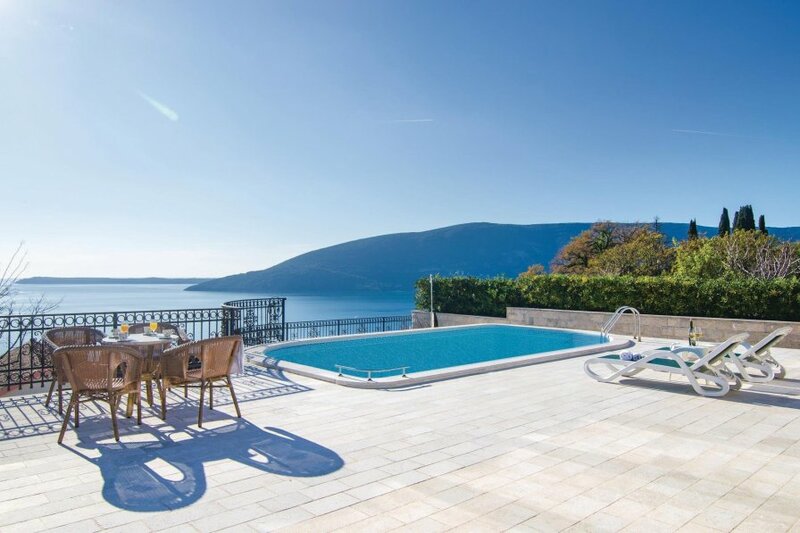 This villa has a swimming pool and beautiful panoramic view over water; it is also only 300 metres from Herceg Novi. The nearest airport is only 20km away. It is set in a very convenient location, just 500 metres away from a stone and pebble beach. There's also a restaurant only 200 metres away. The villa has free wireless internet. You can also park in the garage on-site at no extra charge. The villa is well equipped: it has a refrigerator, washing machine and dishwasher. The property has a sauna; it also has some garden furniture outside.